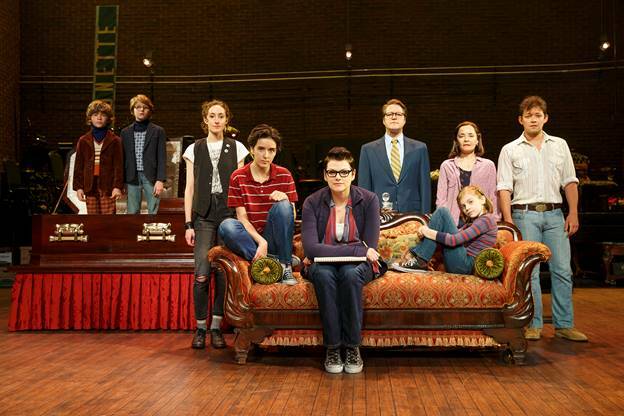 “Fun Home” isn’t really fun. At times, it’s painful, but there is always a thread of love that unites the family, and the actors and audience. The title refers to the funeral home Alison’s father ran, in addition to serving as an English teacher and part-time antique furniture aficionado and historian. But Bruce Bechdel is also a man who had a secret, and that secret propels much of the action throughout the play. The plot has plenty of surprises and the play caters to the audience’s empathy, but there is a truth and honesty to the story that draws you to the carefully worded lyrics, and to the passion each actor gives to their character. Special praise must be given to Robert Petkoff as Bruce (the father) whose vocal quality is clear and exquisite. Susan Moniz as Helen (the mother) can pack more feeling into her voice than most contemporary musicals can boast, and her rendition of “Days and Days” is heartbreakingly effective. The character of Alison is played by three actors; adult Alison (Kate Shindle), “Small Alison” (Carly Gold), and “Medium Alison” (Abby Corrigan) who often share the stage and sing together. The eight piece musical ensemble under the direction of Micah Young blends its sound perfectly for the Bushnell’s acoustics and for the young and old(er) voices. These days it’s rare that an audience is perfectly silent, but the Bushnell audience didn’t want to miss a word or a beat. Kudos to the Bushnell for bringing this deeply personal musical to the area, and to the “Fun Home” cast and crew for mounting such an effective, beautiful production.